My new muffin series is going to finish soon. 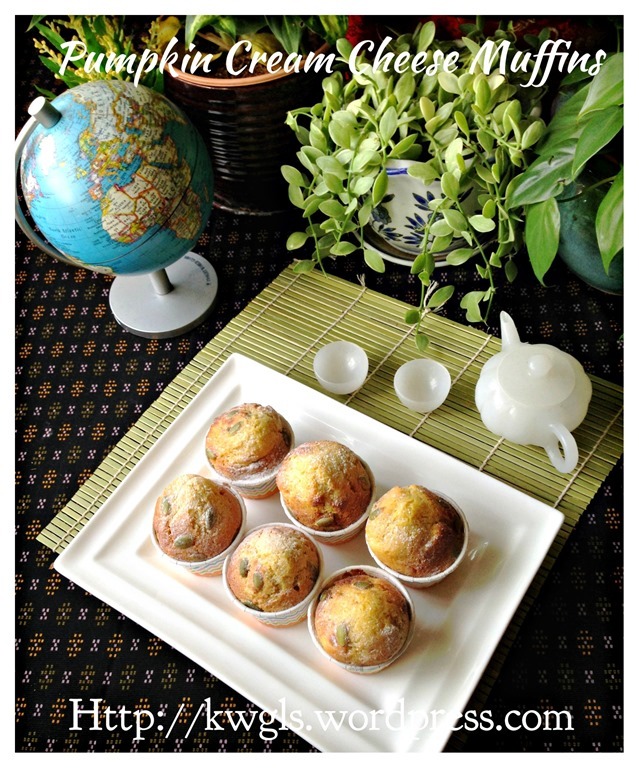 I promised readers that I will design 8-10 muffins over a period of 3 months. 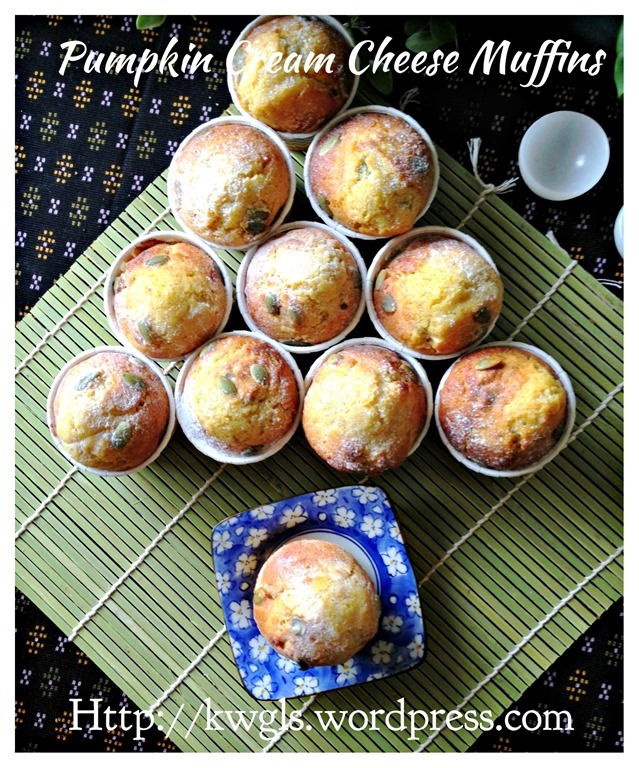 This is the 9th muffins in the new series. 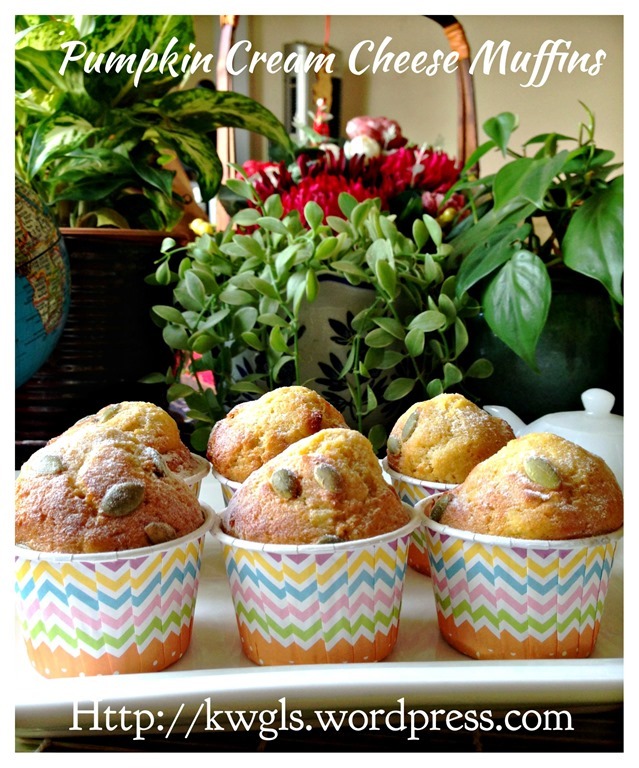 Preparing muffins is definitely not difficult. Mixing wet ingredients to a bowl of dry ingredients. 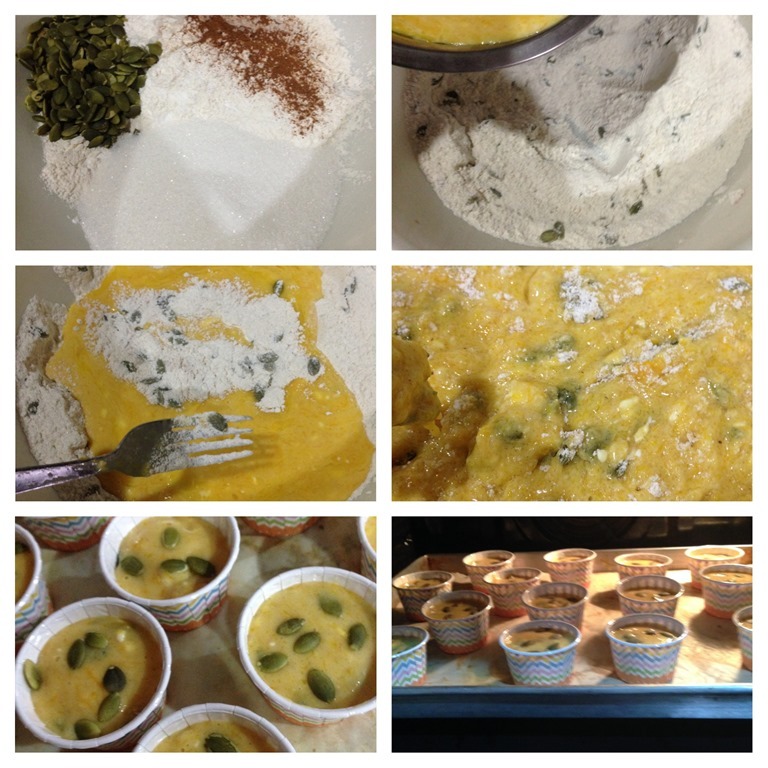 However, looking at some of the readers who tried my muffins, some are successful and some are not. Looking at their muffins, I can roughly know that they have over mixed the batter. If muffin batters are over mixed, one of the characteristics will be chewy and dense muffins due to the formation of gluten in the flour. 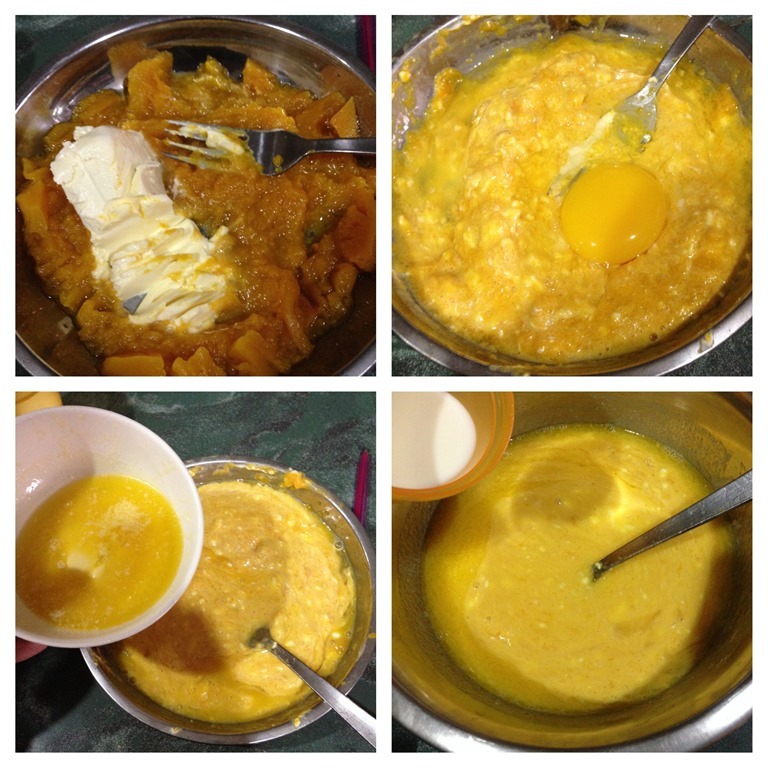 While preparing ogura cake, chiffon cake or even butter cake, we need to ensure that the ingredients are well mixed. But for muffins, lumpy batter is preferred as it will incorporate more air to the muffins making it fluffier and ability to rise higher.. Possibly because of the more complicated cake baking techniques as mentioned above, I presumed some readers will have a tendency to mix the batter until smooth and not even a single lump of white powdery flour is seen. That is not desirable. Do not use spatula to mix the muffin batter as unknowingly, one will have the tendency to “mash” the lump until smooth. Use a fork or small spoon to mix the batter and traditionally, recipe book called for the use of a knife to mix the muffin batter. That will give some indications that how light and fast mixing muffins batters should be. 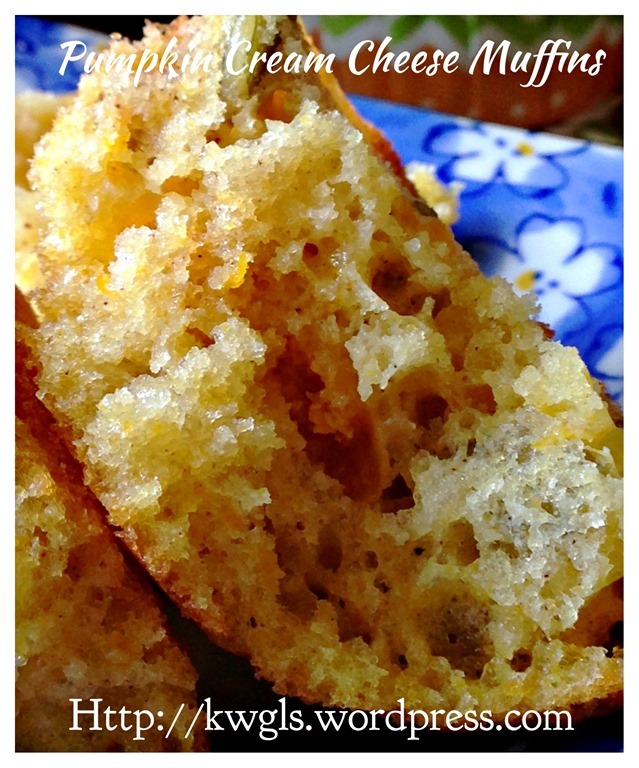 This is a pumpkin cream cheese muffin. Some mixed spice or cinnamon powder was added to flavour the muffins. 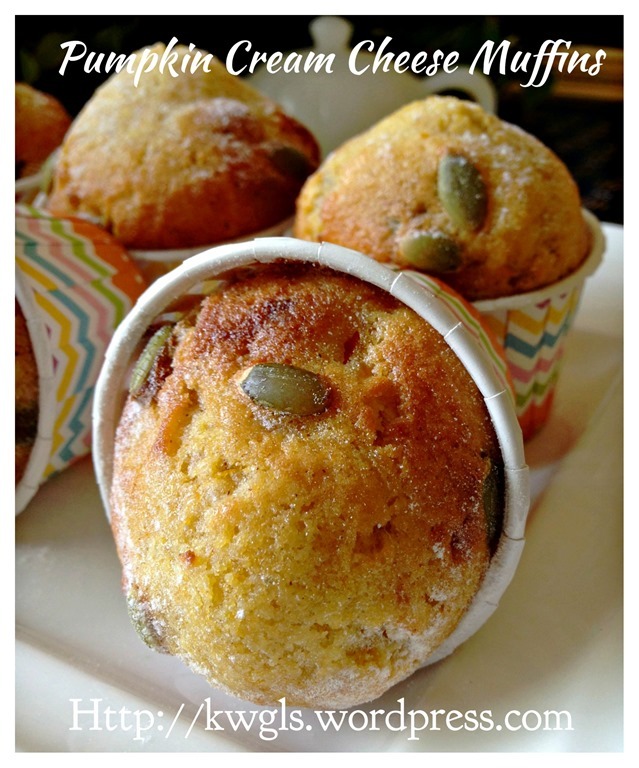 Pumpkin seeds were added to provide something to bite in the muffins. 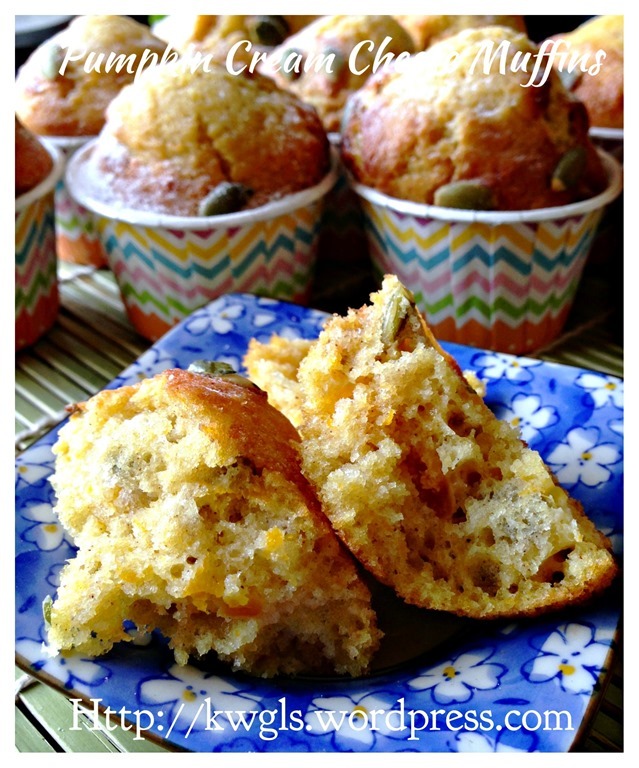 How is the texture of this muffin? It is fluffy and moist. 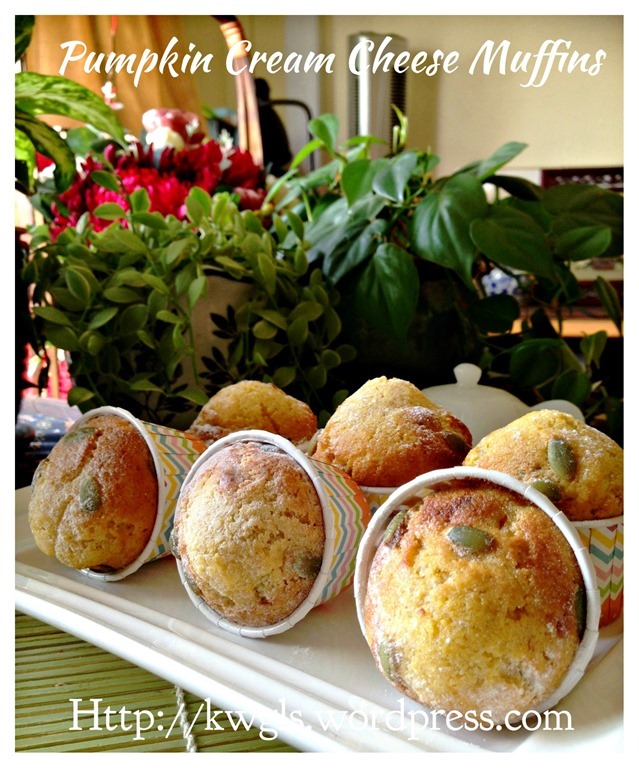 Both pumpkins and cream cheese have the ability to retain moisture in the muffins and this is especially obvious a few hours after it was prepared… Personally, I loved the muffins very much and my boy is willing to take some to the school as a recess snack. 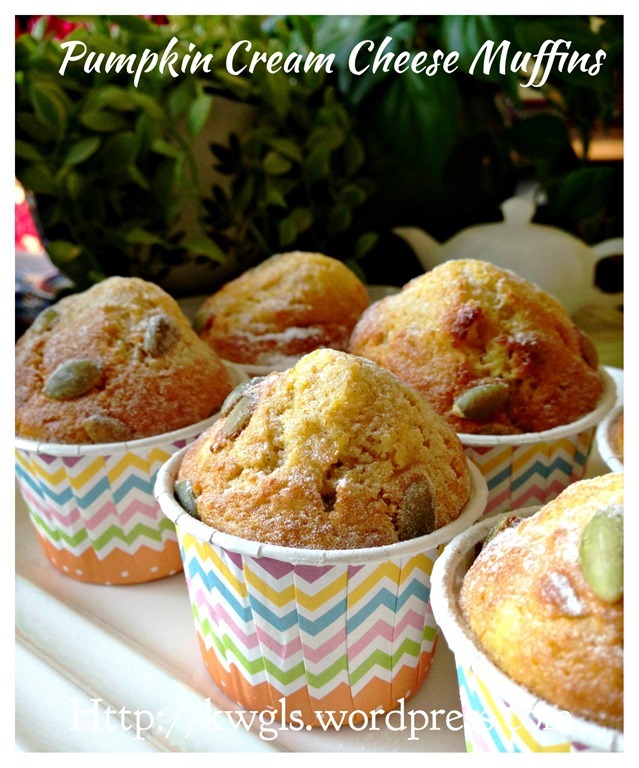 In a mixing bowl, mash the hot pumpkin and cream cheese until it form a puree. Add the eggs, followed by melted butter and milk. Stir until well combined. Set aside for later use. 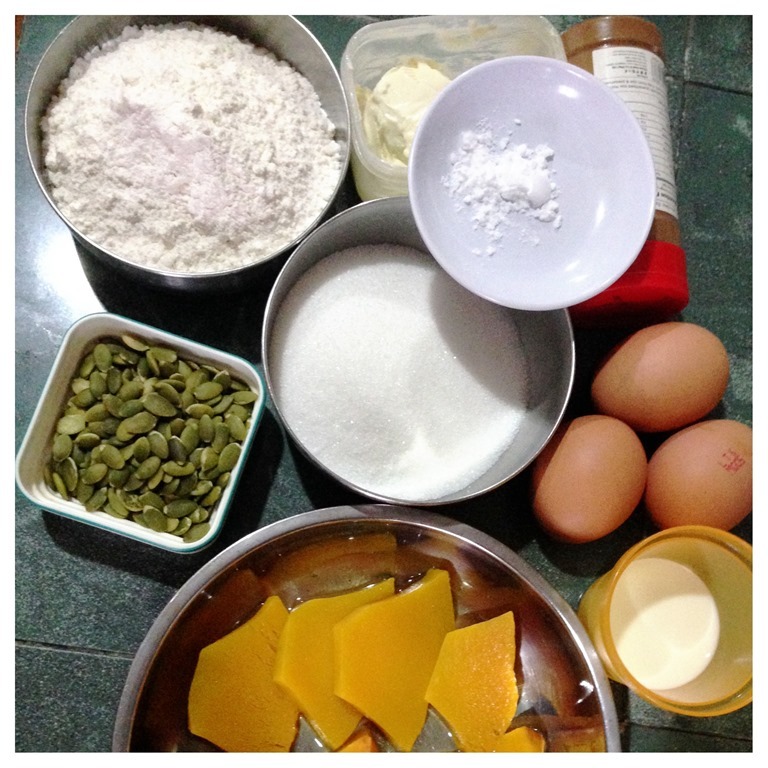 In another big mixing bowl, put all the other dry ingredients (sugar, flour, pumpkin seed, mixed spice, baking soda). Stir until well mixed. Make a well in the centre, pour the wet ingredients to the dry ingredients. Use a fork or knife to quickly and swiftly mix the batter. LUMPY BATTER IS ACCETPABLE. (Note that in the last picture, there are some whitish flour in the batter. It is okay and you should left it there and proceed to the next step). 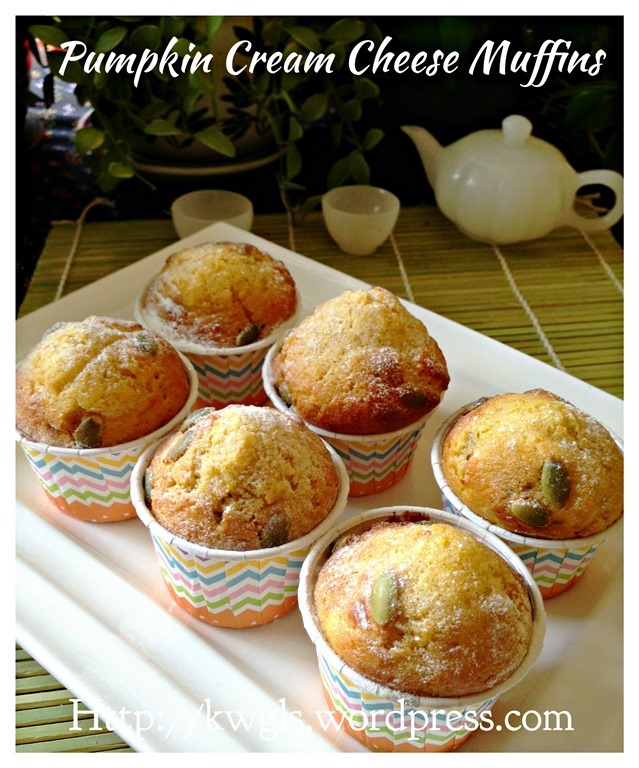 Transfer the batter to the muffin cups with about 3/4 full and top with additional pumpkin seeds if desired. Bake in the pre-heated oven of 180 degree Celsius for 15-20 minutes for small muffins or 20-25 minutes for bigger muffins or until a skewer inserted into the centre of the muffin comes out clean. 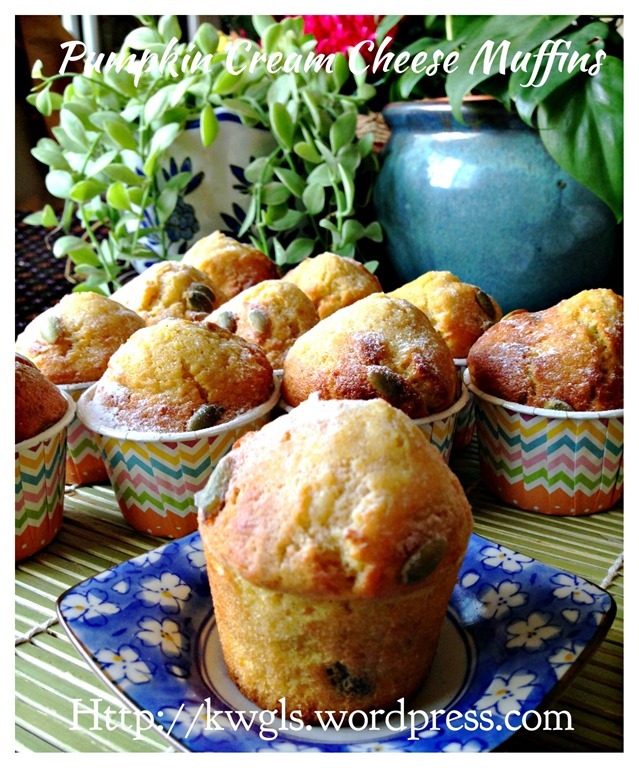 The time of baking will depends on the size of your muffins, do keep an eye on the muffins. Again, all muffins preparation shall be simple and fast. As long as you remember not to over mix the batter and fill the cup with 3/4 cup full, you should get a very nicely shape muffin. 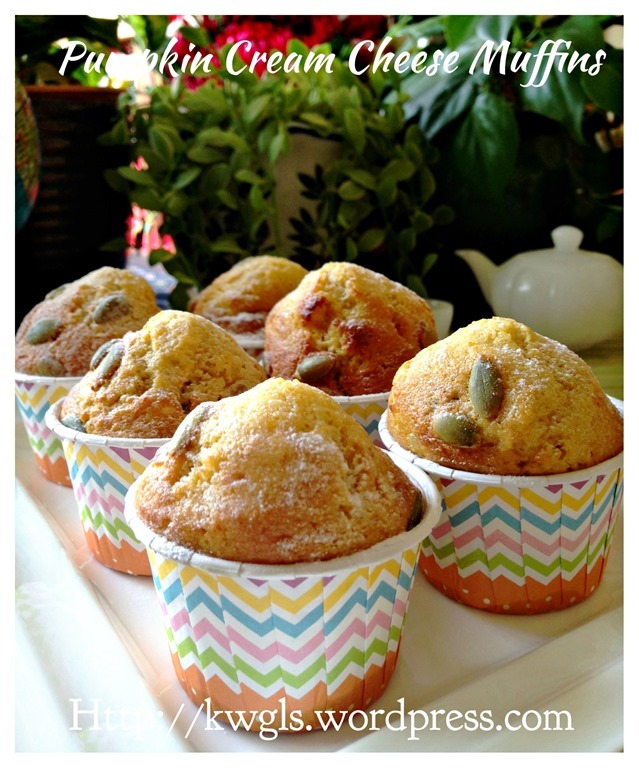 Do give this a go and are you ready to design your own muffins ? 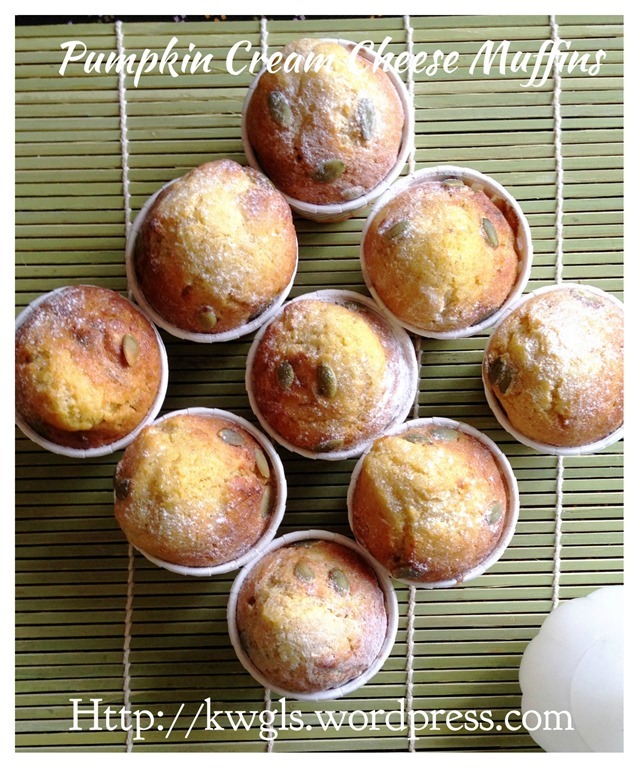 This entry was posted in Cakes and cookies, Food Preparation Series and tagged 8, 金瓜松饼, GUAI SHU SHU, Guaishushu, kenneth goh, postaday, pumpkin cream cheese muffins, pumpkin muffins. Bookmark the permalink. Thank you so much for sharing all these simple doable recipes!! Tried and tasted for breakfast this morning. Yummylicious!! 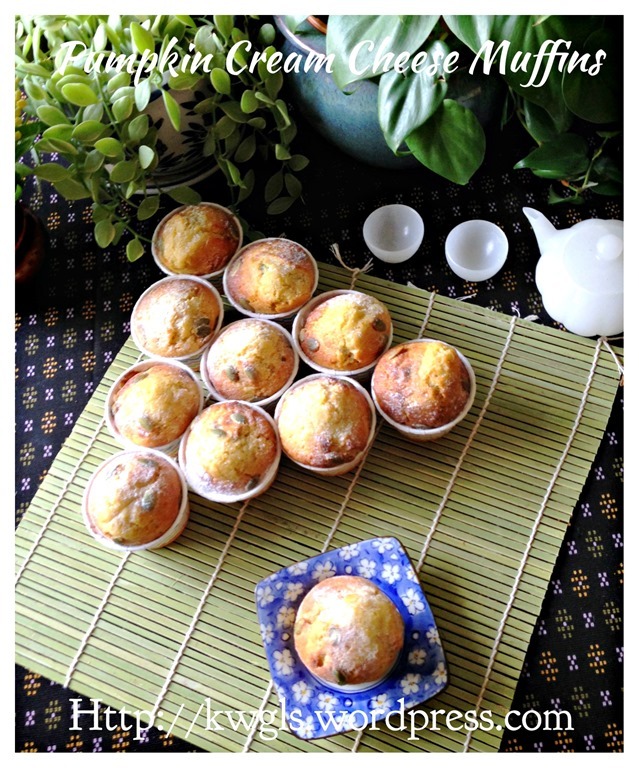 Next try will be Onde Onde muffins. I’m betting it’ll be just as delicious. Thank you, Ken! Please advise whether we have to toast pumpkin seed before mixing with all dried ingredients?